Mark Bingham, 31, a public relations executive and talented rugby player from San Francisco, may have played a role in foiling hijackers attempts to crash the doomed United Flight 93 into a Washington landmark. In a phone call to his mother, Alice Hoglan, he told her, "I love you," and told her about three men who claimed to have a bomb before the phone connection failed. What happened between that phone calls and the plane's nose-dive into a wooded field near Pittsburgh is still a matter of speculation. San Ramon, Calif. resident and former chief operating officer for Thoratec Corp., Thomas Burnett was also on the flight. Burnett, 38, phoned his wife and said that he and two other passengers were prepared to take action against the men who had taken control of the plane, which was en route to San Francisco from Newark, N.J.
"I know we're all going to die - there's three of us who are going to do something about it," he told his wife, according to the San Francisco Chronicle. Counterintelligence experts speculated that the plane was headed toward a Washington landmark before it crashed. Moments before the tragedy, three other hijacked planes, also traveling from the East Coast to California, destroyed the World Trade Center in New York and a portion of the Pentagon in Washington, D.C. This was the only flight of the four that did not reach its target, which authorities believed to be a Washington, D.C. landmark. "That gives us reason to believe that perhaps Mark was able to help save the lives of people on the ground," Hoglan, herself a United Airlines flight attendant, told NBC's "Today" show. A senior U.S. intelligence official told MSNBC.com that mobile phone communications from Flight 93 suggest that three passengers overpowered the hijackers but were unable to maintain control of the plane. 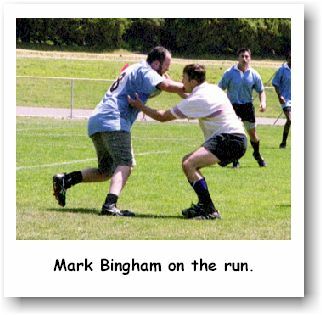 Mark Bingham was a talented rugby player. He began playing high school rugby when he was 16, and went on to play rugby during all of his years at the University of California, Berkeley. He was part of the 1991 Cal team that won the national championships. After college, Mark played Division I rugby for several years with the Olympic Club, a team based in San Francisco. After a brief hiatus from rugby, he returned to the game with his current team, the San Francisco Fog, a newly created Division III team who's mission of spreading rugby to groups in America not traditionlly exposed to the game he embraced wholeheartedly. "Rugby was an essential part of his life," said Fog president, Derrick Mickle. "He loved the game, and how it changes people for the better. It formed his character: tough, calm under pressure, always supportive of his mates and always a gentleman. Mark was a generous, incredibly caring friend. 'With you' was pretty much his life's motto. I have absolutely no doubt that the reason that plane did not make its target was in part due to him. He was not one to let someone hurt another person and get away with it." Friends said Bingham was a large, athletic man who was once gored in the leg while running with the bulls in Pamplona, Spain just weeks after dislocating his shoulder in a rugby match. He was the type of person, they said, who wouldn't be afraid to take on the hijackers. If Bingham was part of the struggle with the hijackers aboard Flight 93, it wouldn't surprise his former rugby coach, Jack Clark. "Mark was very brave," Clark said. "He would have tried to look after others and provide some resistance." 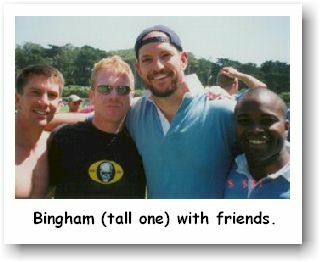 Bingham, a formidable 6-foot-5 starter for the Bear ruggers, had recently attended a 10-year reunion of the 1991 championship team, Clark said. "He was a fine guy, his own man, something of a free spirit and real bright, " Clark said. "He was in the prime of his life." "Today, in the face of this great tragedy, I am taking a small amount of comfort in the growing body of evidence indicating that Mark was a hero," said Fog teammate, Bryce Eberhart. "He was a man of great warmth and zest for living, and a true 'citizen of the world.' He was a loving son and devoted uncle and everyone's good friend. And he was a true mate. He will be sorely missed." Former Cal rugby player died in plane crash Tuesday. "Mark was just recently on campus this spring with his teammates during a reunion of the 1991 national championship team. The rugby program, as well as the entire Cal family, is devastated by this tragedy. Mark was a very bright, athletic young man who was in the prime of his life. Our hearts go out to his family and friends in this moment of great sorrow." As United Airlines Flight 93 entered its last desperate moments in the sky, 31-year-old passenger Jeremy Glick used a cell phone to tell his wife, Lyzbeth, of his impending death -- and pledged to go down fighting. Glick told his wife that the Boeing 757's cockpit had been taken over by three Middle Eastern-looking men wielding knives and a red box that they claimed was a bomb. The terrorists, wearing red headbands, had ordered the pilots, flight attendants and passengers to the rear of the plane, which was headed from Newark to San Francisco. Lyzbeth Glick, in turn, informed her husband that another hijacked jet had already crashed into the World Trade Center, according to Glick's brother-in-law, Douglas B. Hurwitt, who had spoken in detail with Glick's wife about the 30-minute call. Authorities believe the hijackers of Flight 93 turned the aircraft around and were aiming for a target in Washington. Glick said he and others aboard the plane had decided to rush the cockpit and try to subdue the terrorists -- a display of resistance that may have staved off a much worse catastrophe. "They were going to stop whoever it was from doing whatever it was they'd planned," Hurwitt said. "He knew that stopping them was going to end all of their lives. But that was my brother-in-law. He was a take-charge guy." Glick's cell phone call from Flight 93 and others like it provide the most dramatic accounts so far of events aboard the four hijacked aircraft during the terrifying hours of Tuesday morning, and they offer clues about how the hijackings occurred. Still, much is unknown about how bands of three to six terrorists on each airliner -- apparently armed with knives, razors and box cutters -- eluded security measures, took control of the four aircraft and committed the worst act of terrorism on U.S. soil. On Flight 93, at least, passengers said they were going to fight back. Ten minutes into the 30-minute call with her husband, Lyzbeth Glick asked her father to call the FBI on a separate line, Hurwitt said. FBI agents monitored the last 20 minutes of the call and are studying a tape and transcript. Glick, a sales manager for a technology firm who celebrated his 31st birthday on Sept. 3, told his wife that he hoped she would have a good life and would take care of their 3-month-old baby girl -- before the phone call faded out amid what Hurwitt described as "random noises and screams." It is unclear what Glick and the other passengers did next, but Flight 93 was the only one of four planes hijacked on Tuesday that did not smash into a major target on the ground. Some are already describing as heroes the passengers who may have tried to thwart the hijackers' plans. Pennsylvania Rep. John P. Murtha, the ranking Democrat on the House Appropriations defense subcommittee, said at the crash site near Shanksville, Pa., yesterday that he believes a struggle took place in the plane's cockpit. He added that he believes the plane was headed for a significant target in Washington. "There had to have been a struggle, and someone heroically kept the plane from heading to Washington," Murtha said. Whoever was ultimately in control of the plane, Flight 93 made a number of odd maneuvers in midair before it finally plunged to earth. "Halfway through its trip, around Weston, W.Va., it took some sharp turns, all within about two or three minutes," said Jeff Krawczyk, chief executive of Flight Explorer, a software firm that uses Federal Aviation Administration data to track flights. "It was going west, then took a turn to the north, and then went west again," Krawczyk said. Then the plane headed toward Kentucky and took a sharp turn south toward Washington, and around that time the FAA center in Cleveland lost contact with the flight, apparently because someone on board had turned off its transponder, he said. Brad Clemenson, a spokesman for Murtha, said the aircraft apparently made at least two other sharp turns during its last minutes -- swerves that are detectable in Flight Explorer's computerized reconstruction of the jet's path. Dennis Fritz, director of the municipal airport in Johnstown, Pa., said the FAA called him several times as the plane approached his city, and even warned him to evacuate the tower for fear the jet was going to plow into it. "They said the plane was very suspicious, and they didn't know what it was doing," Fritz said. Flight 93 crashed into a field 14 miles south of Johnstown. The wife of another passenger has also spoken of farewell phone calls from her husband on board the plane in which he, too, mentioned a plan among the hostages to thwart the terrorists. Deena Burnett, wife of 38-year-old California businessman Thomas E. Burnett Jr., said she received four calls from her husband. During the first call, he described the hijackers and told her that they had stabbed and seriously injured one of the passengers, and he advised his wife to contact authorities. She informed him that the World Trade Center had been hit by another hijacked jet. Thomas Burnett called back shortly thereafter to report that the wounded passenger had died and that he and some others "were going to do something" to stop the terrorists, Deena Burnett told KCBS Radio in San Francisco. Kathy Hoglan of Los Gatos, Calif., said her nephew, 31-year-old Mark Bingham, did not specifically mention a plan to tackle the hijackers in his cell phone call to her at 9:44 a.m. Eastern time. Bingham managed to tell his aunt and mother, Alice Hoglan, only that the plane had been hijacked and that he loved them before the phone "went dead," Kathy Hoglan said. But the 6-foot-5 former University of California rugby player would undoubtedly have joined any such effort, she said. "He was calm but scared, as if he knew something was going to happen," Hoglan said. "There's no doubt he wouldn't have let them get away with it." Aboard the other doomed flights, passengers and flight personnel also frantically used cell phones to describe the terror unfolding in the sky. Betty Ong, an American Airlines flight attendant aboard Flight 11, which slammed into the World Trade Center, called her airline supervisor to report that she had seen at least three hijackers with weapons and that more than one person aboard the plane had been stabbed, law enforcement sources said. The hijackers had also told people on the plane flying from Boston to Los Angeles that they planned to crash the aircraft in New York City, the sources said. It is unclear how that telephone call ended. Mark Bingham, 31, of San Francisco was the owner of a public relations firm, The Bingham Group, with offices in New York and San Francisco.